René Colato Laínez was born in El Salvador. 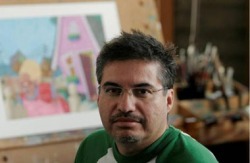 He uses his immigrant experience in many of his award-winning children’s books, and Críticas Magazine has called his characters “immigrant heroes”. He holds an MFA in Writing for Children & Young Adults from the Vermont College of Fine Arts. At Fernangeles elementary school where he teaches, he is known as “the teacher full of stories.” Visit him at www.renecolatolainez.com. Joe Cepeda received his BFA in Illustration from California State University, Long Beach. 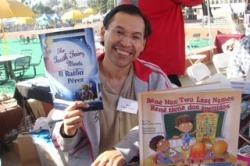 A recipient of the Pura Belpré Honor Award, Joe has illustrated many books and book covers, and has also written for children. His work has been shown at the Society of Illustrators shows in New York and Los Angeles. He currently lives in Southern California with his wife and son. Visit him at www.joecepeda.com.